Not content with asking me the same question several times despite receiving an answer the Labour Party are genuinely taking your money for themselves. 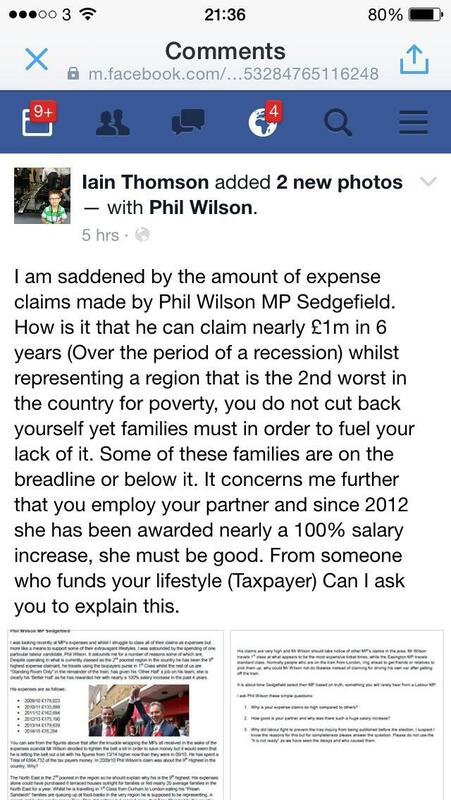 I asked Phil Wilson about expenses claimed, constituents have asked him about expenses and the Conservative candidate have asked him about expenses. Yet he refuses to even reply. 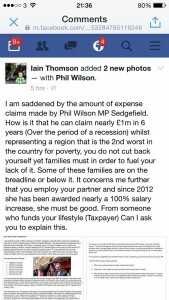 The man refuses to answer constituents concerns about his expenses because he has no justifiable reason for the obscene amount claimed. He has been consistently high compared to his local peers and is unable to justify why. He may be within the parliamentary rules but ethically and morally he is taking his tax-paying constituents for a ride. He refused to raise the tax threshold, he didn’t vote on European bills and he was part of the party who started PFI contracts in the NHS privatising your national health service. At every opportunity to make your life better he has managed to make the wrong decisions. Sedgefield can be a key seat in the catalyst of the north east economy if run correctly. Durham Tees Valley Airport could be a hub of activity bringing in money to local business and taking people on their well deserved holidays but Phil Wilson has told constituents it is lost. He claims he was responsible for Hitachi coming to Newton Aycliffe but in actual fact it was the government who did it, not him. He was part of a party who thought of the ‘bedroom tax’ which now costs you money. He won’t give you a referendum on Europe because he believes you can’t make your own mind up and fears you will vote out. And last but certainly not least. The Labour Party have been in control of the North East for decades and it has not improved. The last time they were in power they nearly bankrupted the country and it is the same MP’s now as it was then for the most part. When challenged the Labour Party become aggressive trolls who don’t argue their points. they just hurl accusations and spread lies. They were once effectively unions who represented the people. Now most people opt not to have a union so they need some ordinary person to represent them. I am an ordinary guy. I am standing because someone needs to. I stand with the only party who fights for everyone from working class to upper class regardless of skin colour, gender, orientation and beliefs. My plea to you is do not let that party of self-serving. expense-taking. constituent-ignoring rich people in again. Be different, be better, believe in Britain and believe in UKIP.